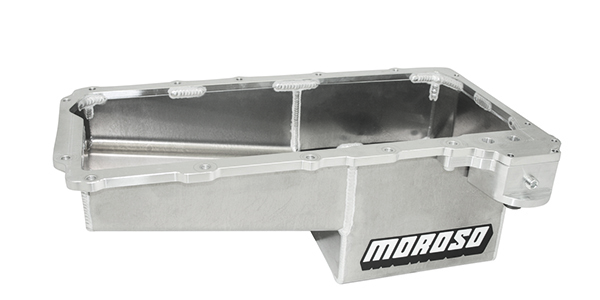 Moroso has introduced a Ford 5.0 Coyote 6-1/4˝ deep front sump steel oil pan, a GM LS Drag Race 7-1/2˝ deep aluminum oil pan, a Corvette, ’05-’13 aluminum coolant expansion tank, and a SBC two-piece billet aluminum valve cover with oilers. Moroso’s Ford 5.0 Coyote 6-1/4˝ deep front sump steel oil pan Part No. 20573 is for early Ford Chassis’ that require a front sump oil pan. Features a trap door baffle assembly, anti-climb baffle and anti-slosh baffle to keep oil contained in the oil pump pickup area during road racing and drag racing. Oil pan has a thick steel rail with a fabricated steel sump with a 7 quart capacity. Designed to be used with the 5.0 Coyote factory windage tray and dipstick. Includes ½˝ NPT fitting for oil temperature sender. Also includes 20 mm fitting for a factory oil level sensor. 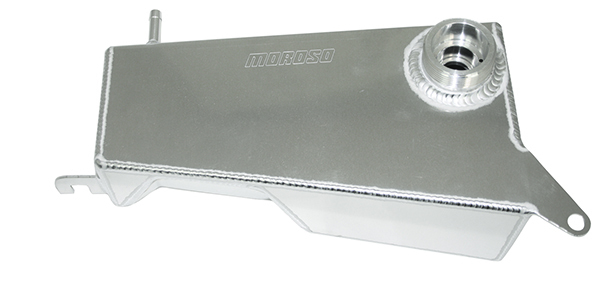 Moroso’s GM LS Drag Race 7-1/2˝ deep, aluminum oil pan, Part No. 21153 is for 2016-Up Camaro and 2016-Up C.O.P.O Camaro. Features a trap door baffle assembly, anti-climb baffle and anti-slosh baffle to keep oil contained in the oil pump pickup area during drag racing. 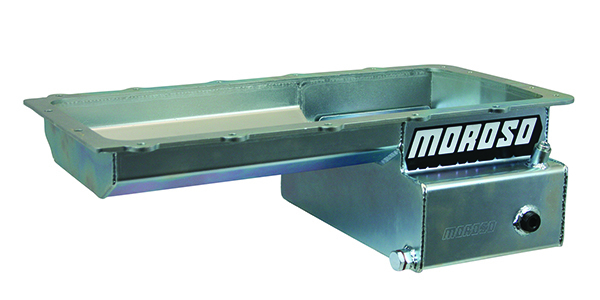 Oil pan has a billet aluminum rail with a fabricated aluminum sump and clears 4.25˝ stroke with most steel rods. Can be used with Moroso Part Nos. 22941, 22943 or OEM by checking clearance and windage trays. Includes a billet aluminum adapter that allows a 22mm thread Moroso No. 22463 or OEM oil filter to be mounted in the stock location, no need to run a remote oil filter. The billet aluminum oil filter adapter has a 1/4˝ NPT sensor port. Moroso’s Corvette, ’05-’13 aluminum coolant expansion tank, Part No. 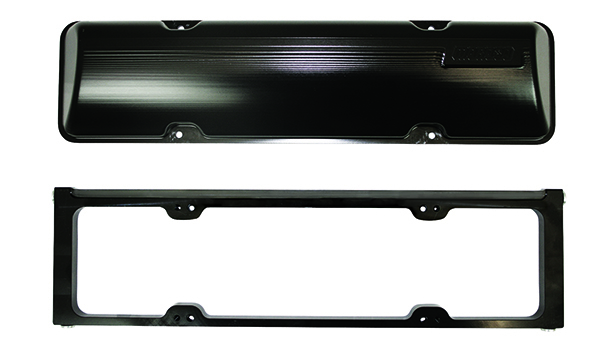 63808, is a direct bolt-on replacement to a stock, two-piece plastic tank. Fabricated in aluminum for strength, because factory tanks fail after repeated high heat situations. This aluminum tank can be polished, chromed, painted, powder coated or left as is for a race look. Features a billet aluminum radiator neck that accepts the factory cap. Moroso’s SBC two-piece billet aluminum valve covers with oilers, Part No. 68051, fit SBC 13 to 23 degree cylinder heads. These 2-3/4˝ tall all-billet aluminum two-piece valve covers have valve spring oilers built into the lower rail. The lower rail bolts to the head with the supplied hardware and the upper portion is removable with an o-ring seal. Allows inspection/ maintenance of the valvetrain without spilling oil all over the headers by having to remove the entire cover. The spring oilers have .025˝ diameter removable jets. Each lower rail has multiple oil supply ports that the supplied -4 AN male fittings or plugs can be screwed into. Having multiple oil supply ports makes plumbing routing easier in sprint cars, dirt late-models and other applications. A single two-piece valve cover with valve spring oiler rail, fittings and hardware weights 3.10 lbs.